Tattoos have been used as form of identification for centuries. One of the earliest examples of this is with the Maori of New Zealand. Lacking a written language, the Maori would use their facial tattoos, Moko, as identification. No two Mokos were the same. Mokos would sometimes be carved on entrance gates on a piece of land so that travelers would know whose land they were on. 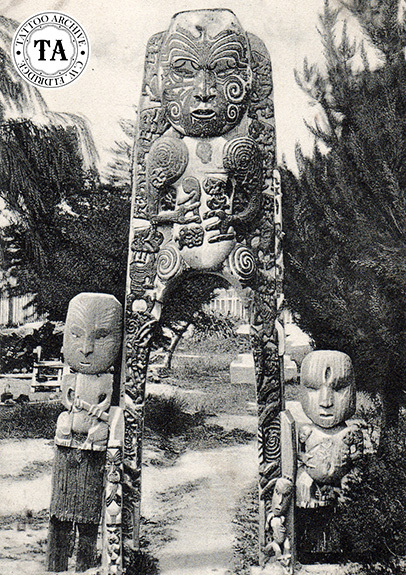 When the Maori sold land to the Europeans, they would use their Mokos as their signature. These Moko tattoos were so much a part of their identity that they could draw their designs from memory. 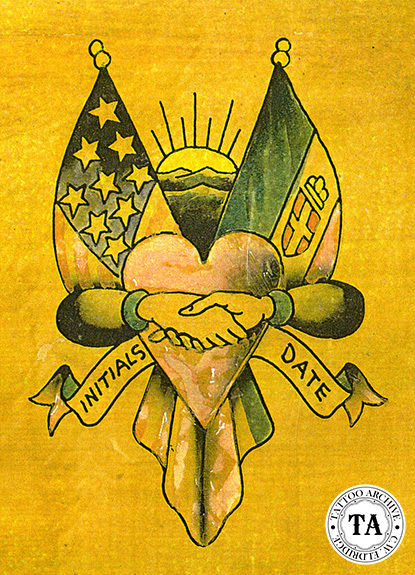 Men and women in the service of their country have used tattoos as identification for hundreds of years. Names, dates, birthplaces, regiment insignias, service numbers are but a few of the tattoos inscribed into the skin. In 1918, Major General O'Ryan of England's Empire Division forbade the tattooing of his soldiers explaining that the tattooed soldiers would be useless for patrol work if they had their identities tattooed on them. On the other hand, tattooing can be helpful in identifying injured persons and also those guilty of criminal offenses. For at least 200 years, the British Armed Forces has kept records of identifying tattoos on their military personnel. Tattooing or other body marking has been used to identify criminals for thousands of years. Branding of undesirables can be dated back to the ancient Egyptian and was common practice among the Greeks and Romans around the time of Christ. Branding and tattooing was also a normal punishment for criminals in China, Japan, Burma, Scandinavia and France until the middle of the 19th century. In the Royal Army Medical Corp Museum at Crookham, England, there is said to be a piece of human skin with the letter "D" branded on it. Until 130 years ago deserters from the British Army were thus marked for life. In 1717 branding was abolished in the Army and replaced with tattooing, this practice went on until around the 1870s. In a 1959 news article, the Los Angeles Police Department was said to have an identification file that they used to identify would-be criminals. This file contains the names of more then 200,000 people arrested each year by the Los Angeles Police Department, 90,000 of which are tattooed. Each person is indexed with identifying information including a description of his or her tattoos and location on their body. The file also lists the tattoos found on people in wanted posters from other parts of the nation. Chief William H. Parker of the Los Angeles Police Department was quick to point out that the tattoo file has also proven valuable in quickly identifying unknown dead or unconscious injured persons and of course has been invaluable in locating missing persons. In the United States one of the most popular tattoos for identification purposes is the government issued Social Security number, or at least that was the case when Social Security was first started. The first Social Security card (055 09 0001) was issued in 1936. In the intervening years, 320 million cards have been issued. When this numbering system was first created, it was considered a boom for the tattoo artist. 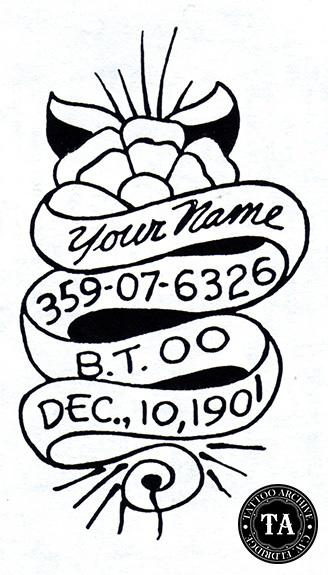 Red Gibbons, then tattooing in Portland, Oregon, stated in a 1937 news article, that he and Sailor Walter were working overtime in their Burnside Street shop just tattooing Social Security numbers on the arms and legs of folks who didn't want to be caught without their numbers. Here is an image from the Zeis Studio that is the last word in military ID tattoos. There is a space for your name, service number, blood type and date of birth. Surely one of the most gruesome examples of the use of tattooing as identification was in Nazi Germany's concentration camps. The incoming Jews would be tattooed on their left arm with a multi-digit number. Many were sent to the gas chambers, but some survived to live with this mark for the rest of their lives. In George Burchett's Memoirs of a Tattooist, he mentioned that between 1946 and 1948 he had several requests from the United Nations Relief and Rehabilitation Administration to aid in removing these infamous tattoos. Ironically, after the Second World War, many former German SS Soldiers were identified by tattoos in their left armpits. Sometimes these tattoos would be their blood type, or two parallel zigzag lines. Of course tattooing for identification is not limited to the human race. Dogs, horses, rabbits, hogs, cats, poultry and probably other animals have been put under the needle for the sake of identification. In 1946 the Thoroughbred Racing Protection Bureau was set up in the United States to prevent the switching of horses in races. The lips of horses were tattooed with identifying marks and in 1974 they had recorded nearly 100,000 horses. 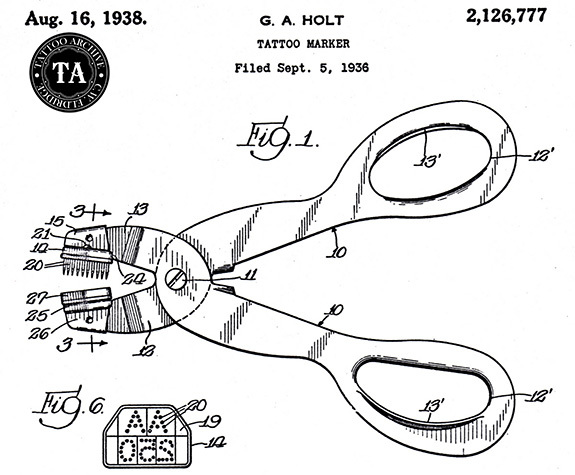 Seen above is a 1936 patent for an animal-marking tool. Tattooing for the sake of identification has been around for years and my guess is that it will continue to be popular.